As the Dean Martin song goes “Oh the weather outside is frightful, but the fire is so delightful, And since we've no place to go, Let It Snow! Let It Snow! Let It Snow! We are asking: Are you wrapped up warm next to the fire, with your decorations up reading this? We hope so, because we have put together a fantastic list of the best Christmas slots (both new and old) to play while waiting for Christmas to knock on your door! Now is the time to play Christmas slots as there’s about 4 weeks (at the time of writing) until Christmas. We’ve put together the ultimate list of top Christmas themed slots so you can glide your way through December playing every one of them. The top Christmas slot list includes games from the most premium casino games providers, including Netent, Microgaming and Playson. There’s something for everyone’s taste. So why not pick your favourites and sled straight to your preferred online casino to give them a spin and really set the Christmas scene! Netent’s new slot for December 2018 (aside from Vikings slot) which is in a word: fantastic! But do we expect anything less from Netent? If you think you’ve seen Christmas slots getting it right before, then you haven’t seen this one yet! 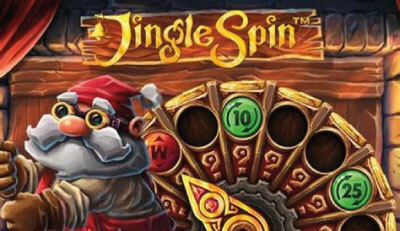 Jingle Spin is a 5-reel, 3-row slot game which is designed with 20 pay lines and a decent 96.48% RTP. It’s perfect for all types of players as it can be played from 20p up to £200 per spins. Top spec graphics include the perfect Christmas scene of a lit fire, plenty of presents, snow, gingerbread men, candy canes and Mr Father Christmas himself. This slot looks impeccable. Jingle Spin might well be a Christmas slot which has the most in game features too. There is an in-game wheel feature which might, or might not reward you located on top of reel. There are also baubles which can also trigger features to give you cash prizes, extra wilds, mystery wins, and free spins! This new Christmas slot can be played at almost all UK slot sites we recommend, and there’s a reason it’s sitting at top of the list at number 1! Jingle Spin Slot: Netent's new Christmas Slot for 2018! Secrets of Christmas is 5 reels and 25 pay-line slot from Netent and was, until this year one of the most “Christmassy” slots out there, packed full of features and successfully capturing the spirit of Christmas. That was until Jingle Spin was released in December 2018 (see above) but – this game is still worth a spin or 3. 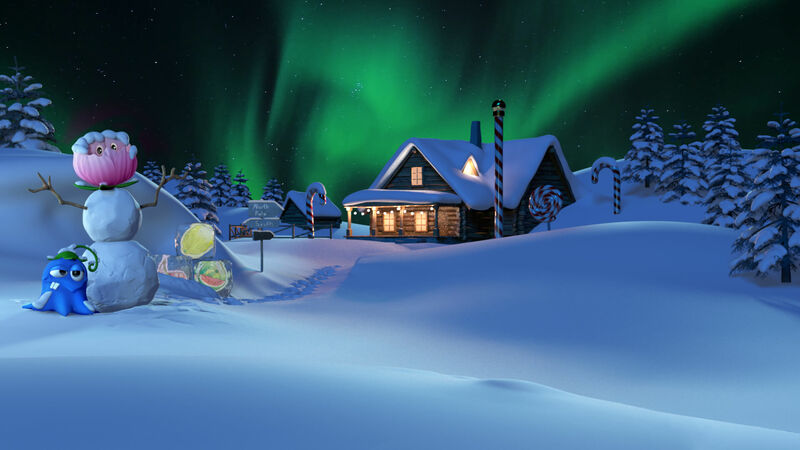 Secrets of Christmas is set in the North Pole, and on the reels you have a very traditional looking Santa, bells, candles, milk and cookies and plenty of others Christmassy objects too. 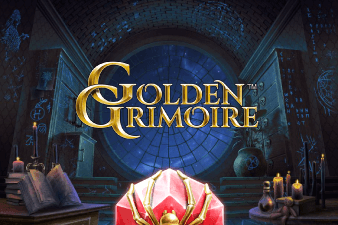 The game looks great and there are some decent in game features so you have some luck in landing yourself a Christmas present! Happy Holidays is a festive slot is by Microgaming, designed with 5 reels and 243 pay-lines and is perfect for any Christmas slot playlist. This seasonally-themed slot features symbols related with Christmas and New Year, including Christmas stockings, a roast turkey (yes, really!) Christmas trees and Santa himself - it looks almost like a Christmas card. The slot is set outside in the snow, and the slot game come equipped with some relaxing Christmas music playing in the background. This game is definitely worthy of powering up in the run up to Christmas and can be enjoyed at most recommended UK casinos. 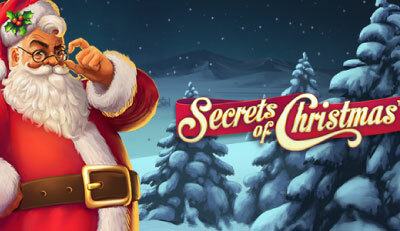 Secret Santa is a Christmas-themed slot - again from Microgaming, who we think do a good job of bringing us lovely, albeit classic themed online slots. Secret Santa is designed with some great looking graphics however; on the reels you have plenty of Christmas and holiday icons. The game’s wild card is the Secret Santa Logo icon, while the scatter is the Cracker symbol. Set up wise, there’s 1024 ways to win and plenty of in-game features too, including the 5 of a Kind Again Bonus feature and the In the Wild Reels Bonus game, but really, it’s the Mystery Multiplier Bonus round that you’ll want to hit as you will be awarded up to a x10 multiplier on your total win sum! 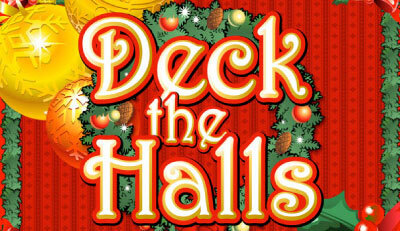 Deck the Halls Slot is a 5-reel 30-payline slot machine from Microgaming which is decked (ahem pardon the pun!) full of festive design as the slot offers plenty of sparkly Christmas decorations. In an over the top kind of way too – and that’s why we love it! This game offers two Wilds. 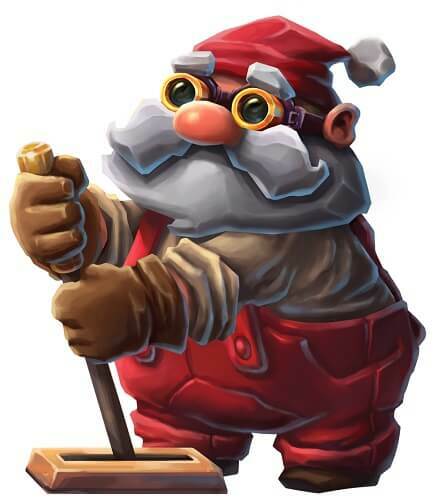 The first being Santa Clause himself, which appears both in the main game and also in the free spins feature, and the second being the Deck the Halls logo, which gets stacked exclusively in the spins. For those not in the know, then it is the Wilds which help you to create more successful winning combinations. As we mentioned, there is indeed a free spins game too. Simply get 3 or more Scatter symbols (Pair of Bells) anywhere on the reels and it will give you the chance to get up to 10 free spins. Deck The Halls is like one of those classic Christmas movies you watch every year, like Miracle of 34th Street; It’s classic and timeless and can be enjoyed at most UK online casinos.